Let’s say you’re planning a trip to Disneyland, the Happiest Place on Earth. You know you want to meet the characters. And you also know that at least once during your vacation, you want to enjoy a nice, long breakfast. 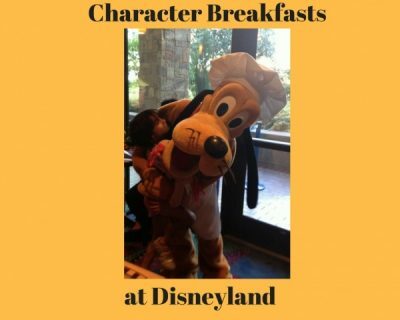 Lucky for you, there are currently four opportunities to have for character breakfasts! Right now, this is the only place to have a character breakfast inside one of the Disneyland theme parks. Minnie & Friends – Breakfast in the Park takes place daily on Main Street, U.S.A. Walt Disney was very proud of this restaurant because of its lovely, elegant Victorian touches. The breakfast buffet features such items as omelets, Mickey waffles, French toast, scrambled eggs, bacon and sausage. The character lineup changes from time to time, but Minnie, Tigger, Chip and Dale, and even Pinocchio are often spotted here. Even if you’re not staying at the Paradise Pier, the Surf’s Up! breakfast buffet may be worth a stop. My favorite way to enjoy this restaurant is to reserve the last possible seating of the morning, which is often as late as 11:00am. This way, I can head to the parks for those blissful early morning hours, and then take a nice break to enjoy a late breakfast. 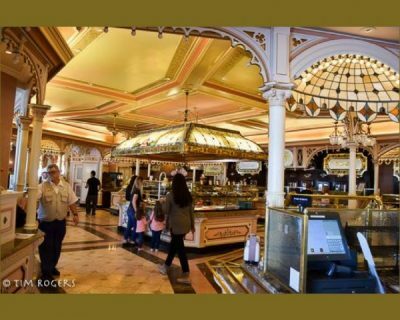 The usual breakfast items are on the buffet, such as Mickey waffles and Minnie pancakes, but there are some cool surprises, like the parfait station, flatbreads, frittatas, chilaquiles, smoothies and salmon. Although character appearances vary, we’ve always seen Mickey here. On our last trip, we also saw Daisy and Stitch! Mickey is dressed as a lifeguard to match the beach party theme. Editor’s note: This is one of the character breakfasts will be changing that will be changing. On July 10, it will be the Donald Duck’s Seaside Breakfast. Here, Donald will be bringing all the beachy fun with him! Soak in those rays and catch some waves on the dance floor with Donald, Daisy and Stitch as you chow down on an all-you-care-to-enjoy breakfast buffet. In the past, the character lineups were extraordinarily random. 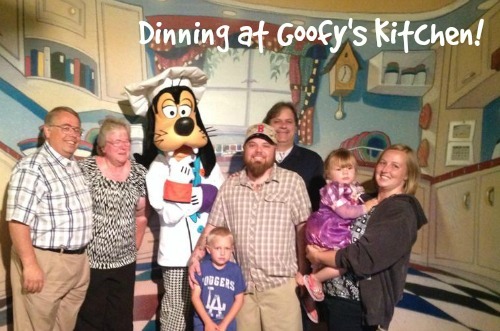 Of course, you always met Goofy, as it’s his kitchen. But I often felt there was a Cast Member in the back of the restaurant throwing a dart at a list of Disney characters. “Okay, I hit Alice! Send her out!” One thing you can count on: You will be sure to find Goofy here. The Chip ‘n Dale Critter Breakfast is held in the beautiful Storytellers Café, in the stunning Grand Californian Hotel. 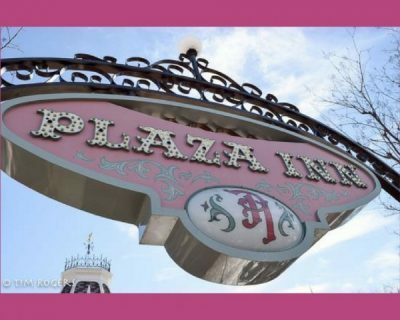 This hotel has an entrance into California Adventure exclusive to guests at the three Disney owned and operated hotels, making it a good place for those guests to eat before heading into that park. The buffet features omelets, Mickey waffles, pastries and fresh fruit. The last time we ate here, there were also braised short ribs and asparagus, so you never know what might show up! This character lineup is hosted by Chip and Dale, and other characters who come by will all be animals you might find in the forest. On past trips we have met Koda from Brother Bear, and Meeko from Pocahontas. 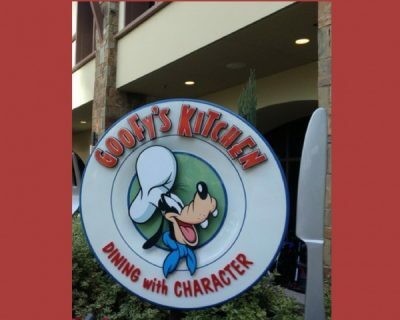 If you happen to visit during a weekend, know that this restaurant also features a character brunch, with the last seating at 2:00pm. This might be perfect for folks who want to use those early morning hours to visit the parks when the weather is cool and the crowds are smaller. Editor’s note: This is one of the character breakfasts that will be changing. It will be the Mickey’s Tales of Adventure Character Breakfast. 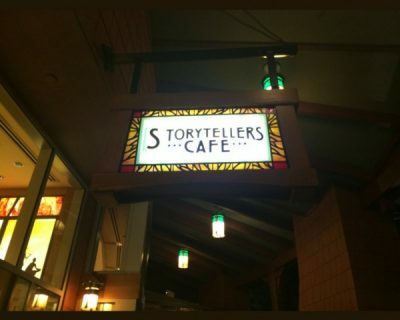 Here, Guests dining at Storytellers Cafe will join Mickey Mouse and his friends for Mickey’s Tales of Adventure. Discover the fun with your adventurous storyteller, Mickey, as he welcomes you into his immersive tales of adventure through his magical Adventurer’s Journal. This change goes into effect on July 10. 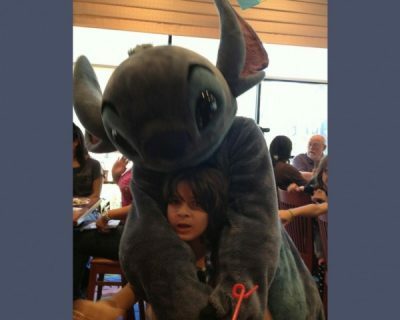 No matter where you’d like to enjoy a character breakfast, know that these experiences are very popular. If you’ve got your heart set on eating at one of these locations, definitely make your reservations in advance. What are your favorite character breakfasts at Disneyland and why? Share in the comments, or on Facebook or Twitter. Your blog posts always make me hungry. I take absolutely no responsibility. LOL!